A recent sell off in Bombardier Inc.’s stock and bonds means the Canadian manufacturer will probably postpone a multi-billion dollar buyback of a minority stake in its rail unit that would allow it to keep all the earnings from its biggest business. Bombardier has the option to repurchase the Caisse de Depot et Placement du Quebec’s minority stake in the rail operation starting in February as part of a 2016 investment by Canada’s second-biggest pension fund. 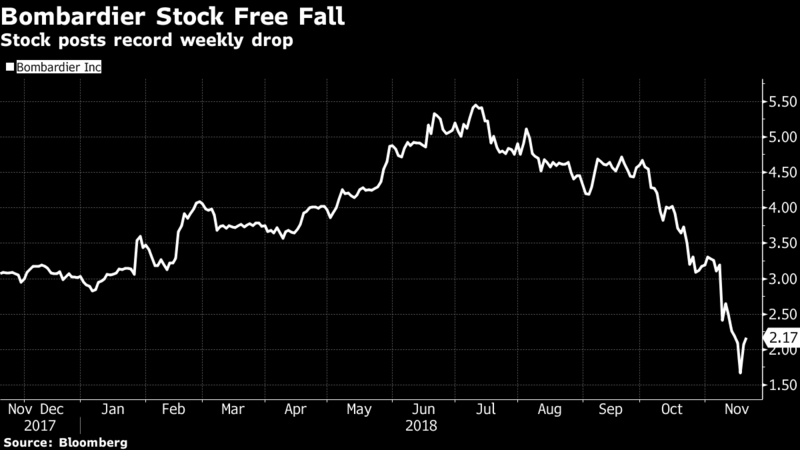 Investor concern over the company’s cash resources, coupled with an unwillingness by Montreal-based Bombardier to sell debt or equity at depressed levels, likely means a buyback is off the table for now, analysts said. Class B shares of Bombardier plunged 37 per cent in Toronto last week after the plane- and trainmaker slashed its 2018 and 2019 cash-flow forecasts on Nov. 8. Bombardier’s high-yield notes led declines among U.S. dollar issuers Friday. Stock and bonds rebounded Monday. Caisse de Depot invested US$1.5 billion in Bombardier Transportation in exchange for a 30 per cent stake that provides guaranteed returns. The holding was reduced to 27.5 per cent earlier this year after the rail business exceeded 2017 financial targets. Seifman estimates Bombardier would have to pay more than US$2 billion for the stake. He and other analysts have said Bombardier would probably need to issue debt, equity or a combination of the two to finance a transaction for the rail stake. Benoit Poirier, an analyst at Desjardins Capital Markets in Montreal, said Tuesday in a note there’s a “low probability” of a buyback given “unfavorable market conditions.” He estimates the “fair market value” of the Caisse’s holding at about US$2.2 billion. “Overall, we continue to support the transaction in light of Bombardier Transportation’s counter-cyclical nature, but would prefer that management wait for market conditions to improve,” Poirier said. The delayed buyback means Bombardier won’t keep all of the earnings from the railway business, which accounted for almost 60 per cent of third-quarter revenue. The unit generated earnings before interest, taxes and special items of US$187 million on sales of US$2.14 billion. Rail will account for an even bigger slice of revenue once Bombardier completes the sale of its Q400 turboprop operations. Bombardier will likely end 2018 with about US$3 billion of liquidity, Chief Financial Officer John Di Bert said Nov. 8. Asset sales announced that day will likely generate an additional US$900 million of cash when the transactions close in the second half of 2019. A buyback of the Caisse “is definitely one area that we’d look at to deploy capital,” Di Bert told analysts on the conference call this month. Maxime Chagnon, a spokesman for the Caisse, declined to comment for this story. Mike Nadolski, a spokesman for Bombardier, couldn’t immediately be reached for comment. Despite Bombardier’s stated interest in buying back the Caisse, “we would not expect the company to make any decision that would worsen its liquidity or balance sheet position,” Kevin Chiang, an analyst at CIBC World Markets in Toronto, said Monday in a note to clients.